Little Boy sends his thanks to all who’ve donated towards this year’s “Stick it to ‘Em” campaign! One of our most favorite local characters is “Little Boy”. 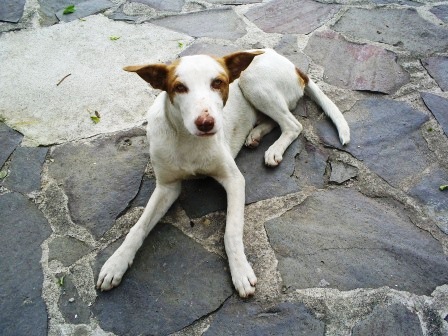 He is on his second human companion who also lives on the street and calls our pal “Canche”. His original street partner passed away about a year ago. After a greiving period that was quite obvious to all of us who know him, Little Boy took up with his current mate. We’ve known this friendly, easy guy for over 3 years now and, know that we can usually find him laying around the plaza in front of the Catholic church conveniently located near the Mercado as well as several comedors. He has many folks along his daily route who keep an eye on him for us and often give him a good meal! Little Boy was one of the first “victims” during our annual “Stick It to ‘Em” vaccination campaign. For the last 2 years, Ayuda volunteers hit the streets and travel to other villages to re-vaccinate the dogs and cats we track for services. We picked the month of September in support of World Rabies Day which occurs annually on the 28th of the month. 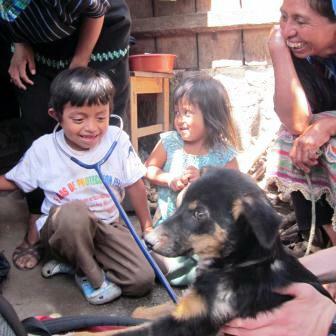 During the last couple of weeks, 64 of the 228 sets of re-vaccinations were given to Ayuda animal family members that dwell in and near Panajachel. Over the next week, we’ll be visiting Jaibalito, wrapping up re-vacs in two Panajachel barrios and will then be lakeside in Jucanya next Sunday, 11 am – 2 pm. Our records show that nearly 300 sets of vaccinations need to be given to cover all those who have already been sterilized through Ayuda, thereby part of the Ayuda family. For those animals not currently part of our program, we provide free rabies vaccines and reduced-price combos along with information on our services. It’s the opportune time to gather names for our next series of sterilization clinics! We also find that day campaigns, such as the one slated for Jucanya and work in the streets provide a perfect avenue for hands-on humane education. Volunteers are trained to field basic care questions, to provide parasite treatments as well as to share the importance of good pet health and how it relates to their own health. A favorite demo involves a simple stethescope. Gently place the ear pieces into the ears of a human; place the scope over person’s heart; finally, place scope on their dog or cat’s heart. The results are immediate! Eyes light up, the connection is made! Now is the time to discuss the need for proper food, clean water, vaccinations, parasite treatments and most of all the health benefits of sterilization. UPDATE: We have reached 76% of the fund raising goal for this year’s “Stick It to “Em” campaign.